Groups in Microsoft Stream let you choose a set of people that you want to collaborate with and set up a collection of resources for those people to share. Adding members to the group automatically gives them the access to the videos and channels within the group. Groups in Microsoft Stream are built using Office 365 Groups. 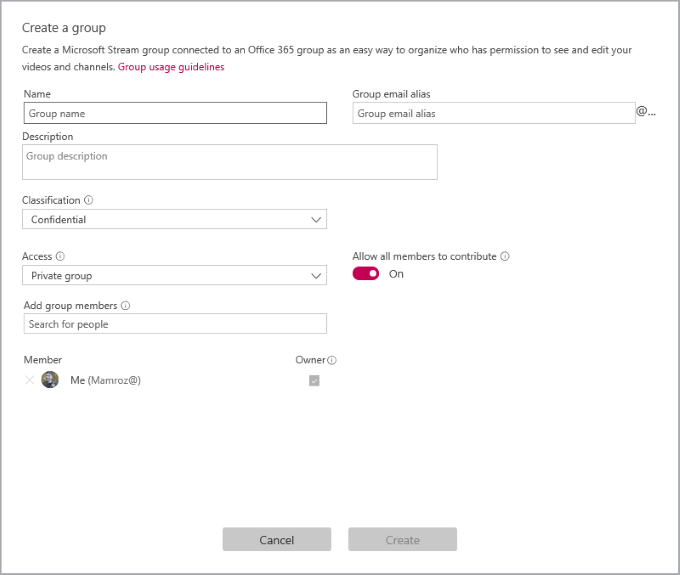 When you make a group in Microsoft Stream it creates an Office 365 Group that can be used across Office 365, giving the group an email address, calendar, site, etc. For more information on how groups work, see Overview with examples of groups and channels. In Stream, go to Create > Group. In the Create group page, provide a Name and Description for your group. In Access, select Private group or Public group to determine who has access to the content inside your group. Public group means the group and videos / channels you add to it to be viewable by everyone in your organization. Private group means your group will be private and only the members of the group will be able to see the contents of the group. Look up people in the Add group members field to inculde people in your group. You can only add individual users to groups. If you would like a member to be an owner of the group check the box in the Owner column to upgrade their permission. Turn Allow all members to contribute to On or Off to determine if the members of the group should be able to contribute to the group by adding/modify videos and channels, or if they should just be viewers of the group only. This setting only applies to Microsoft Stream, it does not apply to the Office 365 Group when used in the rest of Office 365.